Fiction – paperback; QPD edition; 264 pages; 2004. A love of books and the joy of reading figure prominently in this beguiling novel by Irish writer Niall Williams. It begins with a forty-something man writing a love letter to his deceased wife. He lives in County Clare with his two grieving children — teenager Hannah and eight-year-old Jack — and feels so disconnected from them and his own life, that the only way to make sense of what has happened is to pen his autobiography. And so, through two intertwined narratives — one set in the past, one set in the present — we get to discover Jim Foley’s life, his loves, his secrets. Swinging backwards and forwards in time, the story is underpinned by a constant theme: the importance of books to one’s emotional and mental sustenance. For that reason anyone who loves reading — especially classics like Dickens — will enjoy Only Say The Word. But there is much more to this book than one man’s love of literature. In Williams’ characteristic graceful prose we get glimpses of much pain and sorrow. When Foley is orphaned as a young adult and abandoned by his older brother, he flees to America where he meets his wife-to-be, Kate. Socially inept and emotionally crippled, he struggles to make a living and eventually returns to his childhood home with Kate in tow. It is only here, with the rituals of rural living to fall back on, that he is able to confront the ghosts of his past and move on. 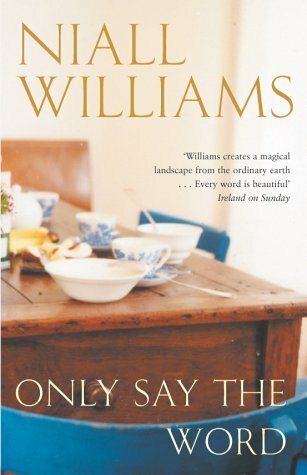 Only Say The Word is an emotional book and Williams is a clever, well-seasoned navigator of the heart, treading a very fine line between schmaltz and romance. He is also an accomplished chronicler of Irish rural life and seems, in this reader’s humble opinion, the natural successor to the late John McGahern, although I feel his prose would benefit from some restraint in places. Occasionally I felt myself being manipulated — the scene at the beach towards the end is a case in point — but I will forgive the author this one little quibble. All in all, Only Say The Word is a beautiful and gentle read that will have you demanding more from this talented writer. Thanks for this, Kimbofo – I’ve been meaning to read a Niall Williams book for ages. I’ve got ‘Four Letters of Love’ on my shelves. This has boosted his appeal somewhat! Litlove, Four Letters is an absolutely gorgeous book — one of my favourite Irish novels.